In a strange twist of events, the All-Star Game was the actual best part of this year’s All-Star Weekend. Kyrie Irving lit up the Crescent City, scoring 31 points and adding 14 assists in a record-breaking game during which both teams cleared 150 points. Saturday night’s festivities, long the most exciting of the break, failed to deliver. Elsewhere, the trade deadline passes, coming in like a motorcycle and going out like a tricycle. Also, the KD-LeBron dichotomy is heating (thundering?) up, though both just seem to want to play their own brands of basketball. 1. The NBA trade deadline didn’t look promising anyway, but it wasn’t great: Thursday’s trade deadline came and passed, with only a small flurry of swaps and acquisitions to whet our collective appetite. The major pieces that media outlets claimed could have been in motion – Rajon Rondo, Omer Asik and GQ Unabomber Kevin Love – stuck to their teams, and speculation will undoubtedly continue to follow them through next season. The most notable move broke after the deadline passed, as the Indiana Pacers acquired Evan Turner from the Philadelphia 76ers in exchange for the relegated former centerpiece Danny Granger, a trade which USA Today has already dubbed “another masterstroke from Larry Bird.” It remains to be seen whether Turner will be able to gel with the incredible chemistry already in place in Indiana, however. The Denver Nuggets had maybe the most deliberately productive multiple trade day, finally trading the exiled Andre Miller, to Washington, and receiving Aaron Brooks from Houston as a backup to Ty Lawson. 2. All-Star Weekend kind of sucked too: John Wall won the Dunk Contest on behalf of the Eastern Conference, and he was by far the most deserving recipient of any of the skills competitions on Saturday night. An underwhelming Dunk Contest followed an underwhelming 3-Pointer Contest, which Spurs guard Marco Belinelli won, and a sort of disappointing Skill Challenge. A bright spot came on Friday night in the Rising Stars Challenge, during which Tim Hardaway, Jr. and Dion Waiters ignited the crowd with a one-on-one sharpshooting duel. On Sunday, the All-Star Game was an offense-first/offense-only contest during which the players set records for, among nine other things, total points scored (318) and most three-pointers made (eight, by Carmelo Anthony). Blake Griffin and Kevin Durant each had 38 points, both falling four short of Wilt Chamberlain’s long-standing record. 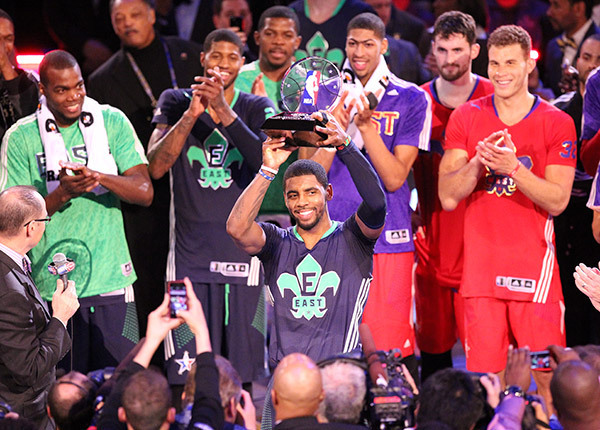 Probably for adding 14 assists to his relatively insane point total of 31, Kyrie Irving earned the All-Star Game MVP, much to the apparent chagrin of one LeBron James. As a side note, Secretary of Education and former Harvard basketball captain Arne Duncan took everyone to school (how many times did we see that on Twitter last week?) during the All-Star Celebrity Game on Friday. 3. KD and LeBron aren’t focused on each other, they promise: The top two MVP candidates, who have basically become interchangeable in terms of basketball prowess this season, both claim to simply be focused on the successes of their respective teams, but we all know better. LeBron has publicly been a little more into the rivalry, having joked that he has KD’s stats sent directly to his Samsung Galaxy S. Durant, meanwhile, has stayed aloof, focusing instead on the otherworldly production of his current season (he says he’s “doing alright“), particularly in the absence of partner-in-crime Russell (HUSTLE BUSTLE…?) Westbrook. After putting up 33 against the Heat in a huge victory on January 29, Durant had the opportunity to close out the season series against Miami, and temporarily shut the book on this rivalry, at home on Thursday night, but LeBron and company had other plans. James shot for 33 of his own in a 103-81 victory away at Oklahoma City, while Kevin Durant had to take 22 shots to get to 28 points. Westbrook returned, playing 25 minutes and looking very similar to the Russ we all remember: exciting and kind of inefficient, going 4-for-12 from the field for 16 points as the Thunder’s second-leading scorer. OKC might have gotten the last laugh, however: James went down with 5:50 remaining in the fourth quarter, the victim of a Serge Ibaka errant arm to the nose which sent him sprawling. Time will tell if LeBron misses any time, and whether we will again see him in a protective mask.